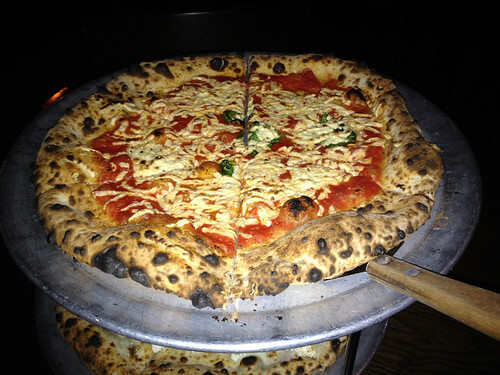 ... was a delicious VEGAN margherita pizza! My dream has come true: Ever since I started avoiding dairy, I have been longing for a place in my neighborhood that serves vegan pizza. And I finally got my wish! Tufino opened its doors in Astoria sometime last year, but it was only recently that I learned that they offer vegan pizza on their menu - and promptly raced over to try it. YUM! This is one of the best wood-fired pizzas I've ever tasted, and being able to order it with vegan cheese just sends me over the moon with joy. Now Tufnio is my favorite pizza place in the neighborhood, and I've already taken several friends there. My vegetarian friend was excited to order vegan sausage on her dairy-cheese pizza, while my lactose-intolerant carnivore friends were thrilled to have Daiya and meat-sausage on theirs. Everyone is happy! Yum!! I was so excited when pizza places around here started offering vegan cheese! I'm surprised that more here in NYC do not offer it - it seems like sometimes NYC has so many great all-vegetarian and all-vegan restaurants that the regular omnivorous restaurants neglect to include vegan options because they assume vegans will just go to the vegan restaurants instead! Daiya forever! Seriously; those shreds changed my life.